Jute magazine holder is designed from jute to store magazines at a single place to protect the problem of cluttering in establishments. These holders are manufactured from the organic material jute that provides strength and durability to the product. They are perfect to be used as a storage product to keep the magazines together in as organized way. This best option to store magazines in a systematic manner is reckoned in the market for high utility. Long lasting life and high strength are the distinct features of these jute magazine holders made from jute. Widely used in the library, study room, drawing room, children room, etc. of offices, homes, and other establishments, they are ideal to add beauty to the decors. Jute magazine holders are available in varied designs, styles and colors to match up every dÃ©cor. They are treated bleached and dyed in various vibrant colors to meet the requirements of the users. Light weight, and portable make these holders of jute highly valued if compared to the holders designed from other material like plastic, metal, etc. They can be easily paved in any corner of the establishment. A user can easily fold them and keep anywhere. In addition to this, they are handy as well as compact that ensure their space saving nature. 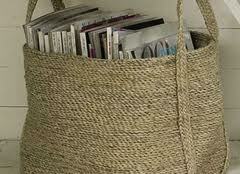 These handmade jute magazine holders are 100% natural, eco friendly and biodegradable. Jute magazine holders can be easily decomposed after using them without worrying about any kind of environmental pollution. They can be easily availed in simple as well embellished patterns. They are designed with mirrors, beads, stones, gems, laces, etc. to enhance their beauty. Moreover, they are also available with prints, embroideries, patch works, etc. Besides using them at home, jute magazine holders are also considered as the ideal option to present as gift to relatives or promotional gift item to employees.